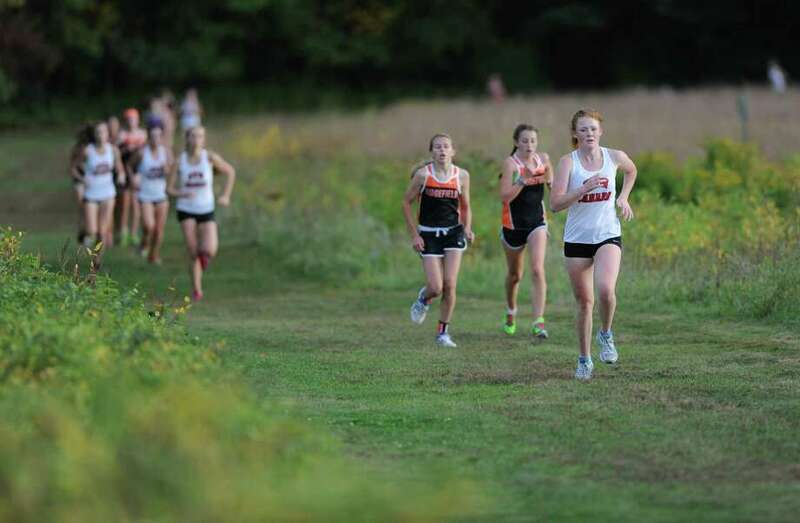 Photos from the FCIAC high school cross country meet between New Canaan, Danbury, Ridgefield, St. Joesph and Trinity Catholic at the Waveny Park course in New Canaan, Conn. on Tuesday, Oct. 8, 2013. The New Canaan girls indoor track team is downplaying its prospects for the season. One does not have to dig too deep, however, to see a well-rounded and formidable squad that will likely make some noise this season in the FCIAC and beyond. Having finished 14th in the FCIAC last season and eighth overall in the Class L State tournament, fifth-year coach Art Brown thinks the competition this year will be tough. "We are in a very strong league so it is hard to predict how we are going to do. I think we'll do better, but it is really too early to tell," Brown said. Helping his cause is the fact that a remarkable 99 girls have signed up for the team. While all may not remain on the team, Brown is happy to have such a deep talent pool. "We have a lot of young kids that have a lot of potential," Brown said. The last time the Rams lit up the FCIAC was in 2004 when they were the runner-up, as they had been the two years before that. And for five straight seasons, from 1996-2001, New Canaan brought home the FCIAC crown. Clearly, the team is now eager to return to its glory days. "The underclassmen are very motivated this year," co-captain Liz Gordon said. "Our relays should be solid, and all the various distance groups look like they are going to have a strong season." Perhaps the marquis event for New Canaan is the 4x800 meter relay in which the team placed third at the CIAC Class L Indoor Track and Field Championship last February. That same unit -- comprised of Gordon, Isabel Hetherington, Maureen Schott, Emily Wood, Allie Bel Bruno, and Cassie Miller -- returns this season. At that same event, then-sophomore Beth Kelley placed third in the pole vault. The team will certainly look to Kelley, who received FCIAC All-Team Honorable Mention honors last year, to bring in points for the team this season. "We have a lot of middle distance and distance girls, so we are looking forward to having some good 600 meter runners and some good 300 meter runners," co-captain Azadeh Amir-Aslani said. While the nucleus of last year's team returns, the Rams did lose some key players. Isabelle Herde and Sydney Czech, formidable shot putters, have graduated, and shot putter Tess Decker has switched to the basketball team. Key throwers this year include sophomores Emily Conley and Callie Busch. "We definitely hope to make the State Open and do better than we have in the past and maybe win the 4x8's in the States," co-captain Alexandra Naughton said. "We want to encourage girls to qualify on their own for individual events and get as much of our team involved in the post season as possible." "We want the younger girls to come every day, have fun, and get better," Hetherington said. While Brown said that he does not anticipate any records broken this season, there remains a quiet optimism that pervades the preseason practices. "If we stay healthy, progress as the season goes on, we should be pretty respectable," Brown said.